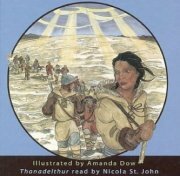 1 What does it take to survive in the winter of the Canadian north with no supplies? It takes a special kind of courage, determination, and resourcefulness. These were all traits found in a young First Nations woman named Thanadelthur. 2 In 1713, the Cree of northern Canada were at war with the Chipewyan or Slave people. The Cree had the upper hand because they traded furs for guns and ammunition with the Hudson's Bay Company. The Slave people could not get close enough to the fort on the Hudson Bay to make the same trades. 3 As a result of their superior weapons, the Cree were able to kidnap many Slaves. Some of these were young women. One of those was Thanadelthur. 4 Thanadelthur was a very strong-minded young woman. She was kidnapped when she was about 17 but had no intention of staying with her captors. At the first opportunity, she and a friend escaped. 5 Early winter was not a good time for two young women to be alone on the arctic tundra. They could not find their way back to their homeland and found it difficult to snare enough small animals for food.